Description: Scan, clean and repair PC registry to speed up computer work. Check and fix shared DLL's, COM/ActiveX, etc. Delete temporary Internet files & trash files. Schedule registry scanner and make backup for maximum safety. 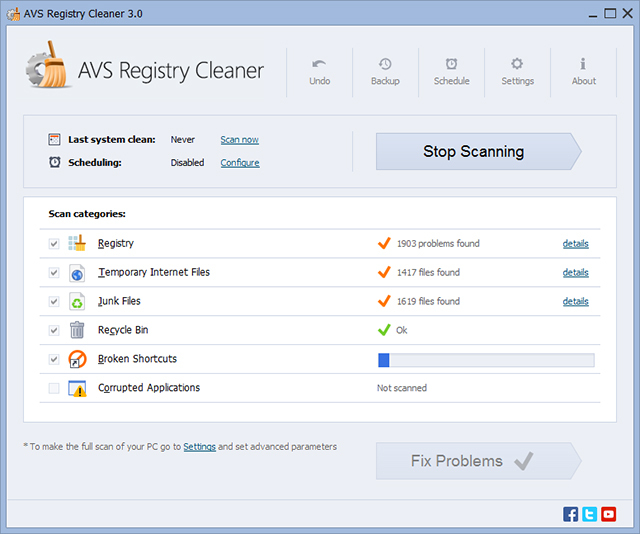 AVS Registry Cleaner is a part of AVS4YOU.com package. Register once at avs4you.com and work with all tools from the AVS4YOU.com package. Subscribe for $39/year or $59/lifetime. Description: Clean your registry with this easy to use yet effective registry cleaner.. Registry Smoker is very accurate at determining which entries are invalid by checking each entry 3 different ways to ensure that it is indeed invalid. Registry Smoker also allows you to create an ignore list to ignore anything that it might determine as invalid, but you determine is not invalid. That way it can ignore it forever in future scans.